I love that cat too. awww. Your new dress is beautiful, you’re gonna look HOT! Of course you got a coupon to use, duh! Now have lots of fun at your French lessons, you are going to be top of the class I’m sure, especially for enthusiasm. Let us know how you get on. as for sleeping with the window ajar & the heating on… tick, tickety tick… can’t help it, as a libran i strive for balance… what’s more balanced than an artificial heat source & nature’s air con? :) happy immersion class & weekend to you! Don’t forget about the reference book 501 French Verbs! Its was my savior for essays and papers in college. Also, that humidifier is adorable. LOVE IT! Cats can be so polarizing (but that is one funny looking cat!) I only wish I had an occasion to wear such a dress too- the sequence and the cut- gorgeous. AND I didn’t realize the class was for one day (no seriously, I thought it was every Saturday, 6 hours for a number of Saturdays..but in retrospect, that would be more of a boot camp than immersion I guess). Nonetheless, hope you have a great time! holy cow that sounds like one expensive saturday class. maybe they actually teleport you to france for the day. and please wear a beret. no, maybe you should just wear you whole halloween outfit – now i am getting all giggly. in seriousness that dress does not look like it cost $83!!! it’s really beautiful. love the color and it is going to look crazy with your red lipstick! fun. hope you don’t fall. i have the same reaction to heels. happy weekend! xo (oh and just give the humidifier a good cleaning like every other day – i saw a something or other about how you really, really want to do that). Haha that cat dream sounds terrifying!! And that sequined dress is perfect for the holidays – great find! Sequins are slowly starting to enter my life, albeit not in a dress like that. You’ll look stunning, my darling as you totter from bar to buffet. Pictures, please. I say this as if I know what walking in heels is like. I sort of sometimes do. The idea of a French class terrifies me, but I am beyond thrilled for you! Can’t wait to hear your recap, come Monday. Oui? I have the humidifier in the pelican since your father loved pelicans! Guest post @ Homestilo!? J’adore! Two favorites in one. Anyway, I’m heading over to Homestilo, see you there, and have a great French class tomorrow! Bonne chance! I think you should totally show up to class tomorrow wearing a beret, and carrying a baguette. OH, and a mustache and striped shirt. Hee-hee! Ok, have fun tomorrow and a great weekend, Erin. I’m off to check you out on Santa’s site. 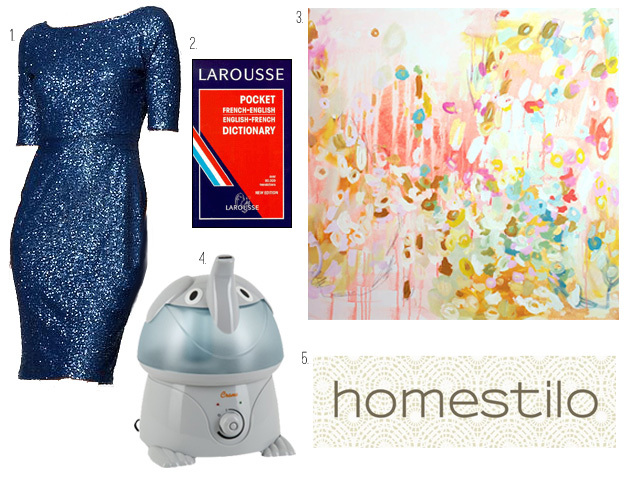 Loooove the blue sequin dress, in fact I’d even throw a party for an excuse to wear it! PS Love your guest post on Homestilo! You should try living over here, our houses are so drafty we don’ tnee dto leave the windows open! I have to sleep with the windows open as well. Only that we have electric heating which is sooo expensive (we pat like 50-60 euros per month, is it as expensive as that in the US? It’s NOT that expensive in Sweden) so we don’t have the heat on during the night. So I hate going out of bed in the morning because the apartment is freezing cold!